ItemBARK_1980.0112.0009 - Unidentified woman and small child standing outside a grocery store in Vancouver; March 1939. Item BARK_1980.0112.0009 - Unidentified woman and small child standing outside a grocery store in Vancouver; March 1939. 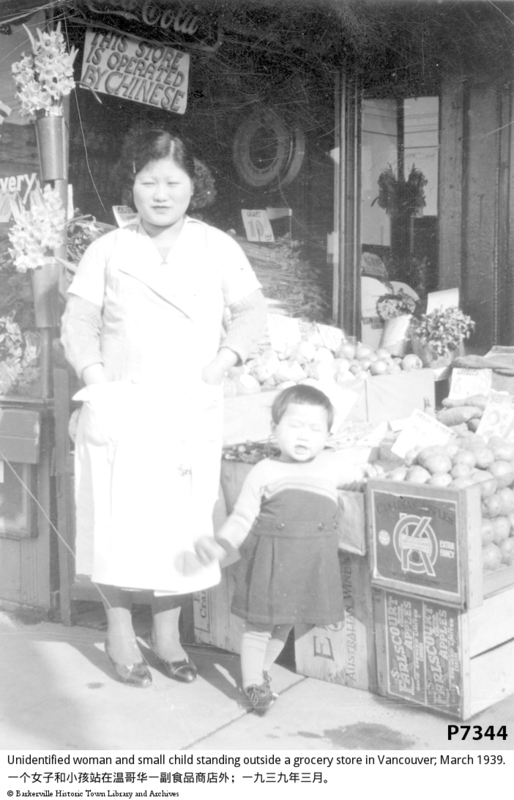 A Chinese lady and her child standing in front of a grocery store. Behind the lady there is a sign it states " this store is operated by Chinese. Written on the back it states " This one no good look funny face isn't? ." Stamp under this print is " VANCOUVER DRUG CO. LTD. Mar.- 3 -1939. NU.- GLOSS. " L.8.7cm W.6.2cm A visitor to the "Who Am I?" exhibit identified the woman as Mrs. Lee Chong.